This is where the first church of St Thomas-on-The Bourne stood from 1861 until 1925. Today, tucked away in the trees, it is a tranquil place for humans to get away from the stresses of the modern world and also a haven for wildlife. It looks at its best in the early spring when it is carpeted with a magnificent display of crocuses which are soon followed by primroses and bluebells. Other than the lychgate, there are no buildings on the site but there are over 800 graves, many with monuments. The story of this old churchyard and of the lives of those buried here make an interesting contribution to the history of this part of Farnham. 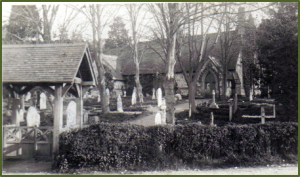 Since 2008 the site has been managed on behalf of the Church by The Bourne Conservation Group as a Living Churchyard. This means balancing proper respect for the value of its heritage with the needs of wildlife in the increasingly busy and built-up area of Farnham. It is now the only churchyard in the UK with a wildlife pond which has been responsible for a welcome enhancement of biodiversity. The site is located on Vicarage Hill on the lip of the valley of The Bourne Stream, a tributary of The Wey. Its approximate area is one acre at a general height of about 105m above sea level. The land rises from the lychgate and evens out where the old church building stood. Originally the site commanded distant views southwards towards Hindhead but today, although there are tantalising glimpses down Old Church Lane, the view is mainly obscured by the neighbouring Acorn Cottage and many trees. Geologically the site is at the western extremity of The Weald on the Folkestone Beds of the Lower Greensand. The natural characteristic of this is well drained, infertile, sandy soil with layers of stone or gravel close to the surface. The effect is to create a dry environment which, when the area was mainly common land grazed by sheep and pigs, supported heathland vegetation of gorse and heather as seen today on Frensham Common. The wider area is of great interest geologically and supports an extremely varied ecology. The Old Churchyard belongs to the Church and is subject to ecclesiastical rules. 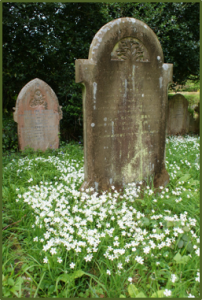 The last burial took place in 1967 and the site is now classed as “Closed.” The general area is administered by Farnham Town Council which in turn is part of the Borough of Waverley in Surrey. For planning purposes the site lies within the South Farnham Conservation Area. In 1849 the railway arrived in Farnham from Guildford and quite soon the population of the town started to rise as the age of commuting was born. 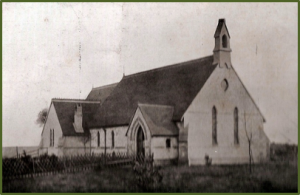 It was not long before the Rector of St Andrews realised that he needed help to manage his far-flung parish and so he commissioned the first church of St Thomas-on-The Bourne in 1861. The building at that time was a simple one with a single aisled nave and bellcote, built at a cost of £344 on a site donated by the Revd John Martyr Ward who had inherited the large Firgrove estate. Burials started soon afterwards. Technically this was a Chapel of Ease for the parish of Farnham to relieve the pressure on both the rector and the parishioners so they did not have so far to walk. In 1862 it was dedicated by the Bishop of Winchester. In 1869 the chancel and transept with a vestry were added at a further cost of £252. This larger building was then consecrated by the Bishop of Winchester, Samuel Wilberforce, on St Thomas’s Day. He was a prominent figure because in his previous appointment at Oxford, in what has become a famous debate, he represented the horrified views of the Church on Darwin’s The Origin of Species. In 1874 the Revd Thomas William Sidebotham was appointed as curate-in-charge. He was later to become the Vicar and remained in office for 33 years until 1907. One of his first tasks was to raise £600 to build a splendid vicarage which can still be seen on Vicarage Hill (known at that time as St Thomas’ Hill). In 1881 the church was further extended by the addition of a second aisle with organ chamber and its own bellcote. 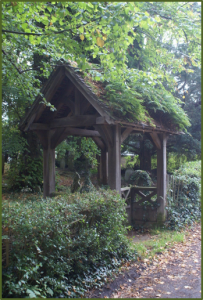 In 1888 the lychgate was built as a gift from Miss Annie Sidebotham to her brother the Vicar. She had accumulated funds from her share in the publication of the highly successful Children’s Hymnbook, a copy of which can be seen in the vestry of the present Church. St Thomas’ continued to meet the needs of the parish for the rest of the 19th century into the early years of the 20th, a period of great social change. This is a subject recorded by George Sturt (1863- 1927) who moved to Vine Cottage in 1900. 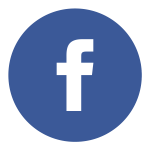 For further information on George Sturt, click here and here. Locally there was increased building activity extending out from central Farnham to Great Austins and Greenhill Road once piped water became available after the opening of the Victoria Reservoir in the same year. Previously, water supply had always been a problem in The Bourne. People of some means liked the better air up here on the hill out of town, but life was not good for many and there were hunger marches in 1908 when those taking part camped on the Ridgway before marching into town. By this time the population of The Bourne had risen from about 600 in 1860 to 2600 and, according to his son, Henry, one of the Revd Sidebotham’s last acts was to announce from the pulpit that the time had come to consider enlarging the church. It was, however, decided in conjunction with the bishop that this site was too small. Fortunately a new one was available on the disused gravel workings known as Ward’s Pit, just round the corner, thanks once again to the Revd Martyr Ward. The decision to go ahead was made at a parish meeting on 22nd January 1907. The original idea was to erect a temporary iron building while the £5000 required was raised. This was considered unsatisfactory by the Bishop of Guildford who suggested the solution finally adopted of building just the chancel and then progressively extending the new building. So, the new church of St Thomas-on-The Bourne was consecrated on 30th September 1911 by the Bishop of Guildford on behalf of the Lord Bishop of Winchester. The altar from the little old church was carried round by parishioners in procession. Sadly the Revd Sidebotham did not live to see this event for he died in 1907 and is buried in the Old Churchyard. The Old Church stood until 1925 when it was demolished. Burials continued in OCY where the church once stood until the early 1960s. The Bargate stone arches, pews & stained glass were incorporated into the side chapel of the new church and eventually all the Chalk stone of the main fabric was also incorporated. Being of distinctive colour it can still be seen in the north wall. The structure of the new church has continued to grow, the last chapter so far being the extension of 2011, the centenary year, to meet the needs of parishioners in the 21st century. Situation in Autumn 2008. In 2008 the first sign that all might not be well in the Old Churchyard were the polypody ferns growing out of the lychgate roof. The impression was confirmed inside where many of the graves were in poor state with some of the stonework collapsed or about to do so and thus in a potentially unsafe condition. The situation was exacerbated by vigorous, uncontrolled growth of brambles, ivy and young trees of various types and dimensions which together not only gave an unkempt appearance to the site but were blocking footpaths and causing more damage. Of particular concern were 7 substantial young trees 30 feet high growing in or very close to graves. English Heritage has recognised that part of the charm of old churchyards is their atmosphere of “pleasing decay.” However it also recognises that if the decay is allowed to go too far there is a danger that much of historical interest will be lost. The same is true in wildlife terms because a site that is too overgrown by dominant, non-native species will lose many less vigorous plants and the creatures they support, thus reducing biodiversity. In the case of this churchyard it seemed to The Bourne Conservation Group that a tipping point had been reached and that unless action was taken much would be lost. Initial Work. After a period of consultation, the Group decided in November 2008 to launch a new project to arrest the decay of the site. With the permission and cooperation of the Vicar, the Revd Johnathan Still, work started without delay based on an Interim Project Plan. In the following year much was accomplished including the first survey of wildlife and giving the site a general tidy-up. The ruined Sexton’s Hut was made safe as were ten monuments that were in danger of collapse. A start was made on clearing the invasive laurel saplings and a new hedgerow of native species planted to screen the cottage on the east side. 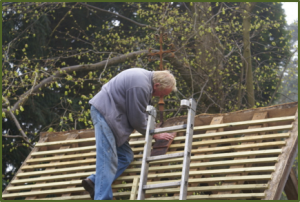 The lychgate roof required particularly urgent action and after consultation with the Diocese, permission was obtained by the Vicar to proceed “De minimis” which meant it required only the Archdeacon’s consent, thus speeding up the approval process. 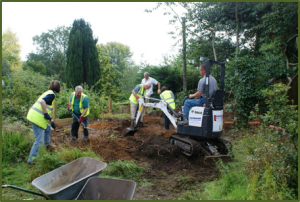 A grant was obtained from the Farnham Institute and a contract let to undertake the work which was completed in April 2009. Creating Wildlife Habitats. The work of enhancing wildlife habitats was continued through the provision of log and stone piles around the site. Additionally a series of high quality bat boxes and nest boxes were installed with the aim of supporting a variety of birds from wrens to owls. Throughout the period, especially over the cold spell at the beginning of 2010, Mary Egan of Acorn Cottage kept the OCY bird feeders filled and has done so ever since!. Just before the end of 2010 a major milestone was reached with the completion of a pond in the southeast corner of the site, made possible by the excavation of the large rubbish pile that had accumulated over many years. This made the biggest contribution to biodiversity enhancement. Recording the Wildlife. Thanks largely to the untiring efforts of Martin Angel the work of observing and recording wildlife in OCY and the immediate neighbourhood went on apace to update the earlier results. A particularly rewarding aspect was the number of moth species recorded and photographed including the copper underwings that populated the lychgate roof and the rare pauper pug breeding in the lime trees. Successful Survey Days were held in 2009 and 2010 under the leadership of Frances Halstead of Surrey Wildlife Trust assisted by Martin Angel and Jane Still, the Vicar’s wife. In 2010 Eleven students from all over Surrey took part and were joined for some of the time by Graham Collins, the Surrey Moth Recorder, and his colleagues. Restoring the Monuments. 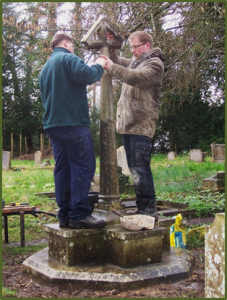 In the Spring of 2010 the Parochial Church Council agreed to fund the restoration of the badly damaged monument of the Revd Sidebotham who served the parish well for over 30 years. This work was completed by Stonecrest that year. By this time OCY had a much improved appearance and this inspired both an illustrated leaflet and a specially convened Heritage Day in June. This raised further funds, including a generous donation from the Overwood Trust, all of which was used to repair a further batch of monuments. This work had been specifically excluded from the grant made for the main project in 2009. BCG was pleased to be able to facilitate this work as a mark of respect for the former worthy residents of The Bourne from all walks of life whose last resting place is the Old Churchyard. The Historical Project. Under the active leadership of Richard Sandars, the historical project to research more about the history of the site and the 800 people buried there got under way and has subsequently prospered. For information on the Historical Project click here. The combination of the attractiveness of the Old Churchyard and its historical associations has made it a port of call for many groups and individuals who have been given conducted tours of the site tailored to their own particular interests. The site was included in the tour of the Farnham in Bloom judges in 2011 and 2012 after which one lady judge remarked that she would have liked to spend all day in the churchyard instead of the ten minutes allowed. It was also included in the first Farnham Walking Festival in 2017. Family History Society in 1989 in publishing a List of Graves and Monumental Inscriptions with an accompanying map has been very valuable. It has enabled BCG to answer many enquiries from those seeking to trace family histories. A link to the map of burial plots and burial records (arranged by name and plot number) can be found on the History Project site. A lot of detailed research on local families was undertaken by BCG member Wendy Maddox, whose death on 22nd. April 2018 is commemorated by the York stone paving in the lychgate, which was generously donated by her husband (and BCG member) John Maddox, and laid by the Group. The formal restoration project was completed in 2011 at which time a fully illustrated report was made to the Surrey Community Foundation. After that time work on the site continued unabated in the form of regular seasonal maintenance and minor enhancements such as stabilising the remains of the Sexton’s Hut and installing a water tank. After a reorganisation of the committee structure within the parish in the period 2015 to 2016, a more formal liaison with the Church was established. An agreed Church Policy was drawn up and in 2017 a Management Plan was prepared by BCG to guide future work on the site. This rightly places renewed emphasis on the risk aspects of the maintenance activities especially those relating to the mature trees and the monuments. 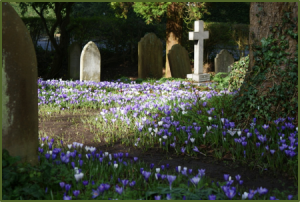 Churchyards tend to be rich in flora and fauna because they are largely undisturbed. With increased development in Southeast England they have assumed increased significance as havens of peace and quiet, and as habitats for wildlife. Since this site has been rather under-managed since the old church was demolished in 1925 and has never as far as is known been treated with chemicals, it supports an even wider variety of wildlife than more active cemeteries such as West Street or Green Lane. For more information on the biodiversity of The Bourne click here. Because of BCGs restoration project, careful records of wildlife have been compiled and maintained up to date. The main inputs were made from surveys in 2009, and 2010 and from a Bioblitz in June 2016. There is also available for comparison purposes an earlier survey of the flora made in 1991 by Denise Todd. The species list in 2017 stands at 143 plant species and 424 animals (of which over half are moths). 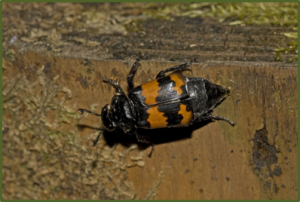 All wildlife sightings on the suite have been reported to the Surrey Wildlife Record Centre and for three years a contribution has been made to the National Moth Night. For information on wildlife surveys click here. Trees and Shrubs. The site has a number of mature trees, some of which can be precisely dated to the 1860s. The lime trees have reached an age when they may be expected to deteriorate. The same applies to closely neighbouring Scots pine trees, some of which have had to be felled in recent years. The Prince of Wales became King Edward VII. James Knight (1805-1868) was a brewer, banker and hop-grower and hence a contributor to the prosperity of Victorian Farnham. Vernon House is now the Grade 1 listed building housing part of the Farnham Library. 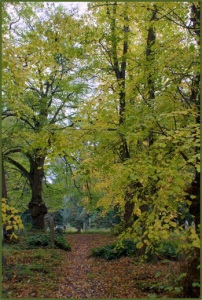 At the suggestion of the Woodland Trust, the two yews and the limes planted in 1863 have been entered into the national record of veteran trees. There are some other good native smaller trees including holly, hazel and hawthorn all of which provide good wildlife habitat. From 2008 the only significant tree management undertake was dead-wooding of the limes but in 2016, with the help of the Waverley tree officer, a more positive plan was put in place. The Understorey. OCY is noted for its display of spring flowers which includes snowdrops, crocuses, primroses, native daffodils and bluebells all of which appear to be spreading now that more aggressive plants are firmly under control and more light is getting into the site. The spring flowers are followed by clumps of Honesty and Greater Stitchwort, staellaria holostea Saxefrage and, later in the year, there is an increasing coverage of cyclamen which needs to be kept under control. Other Species requiring control include the ivy, Hedera helix, growing along the ground and clumps of Western Polypody fern which if left will suppress the woodland ground flora that should be encouraged. 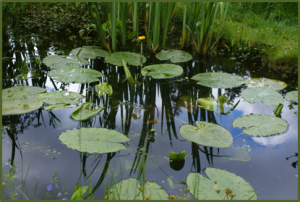 The greatly enhanced population of aquatic species because of the introduction of the pond and associated tiny bog garden. These include frogs, toads, newts, pond snails and many smaller species. The pond is also an important source of water for foxes, badgers and birds. Artificial Habitats. Contrived habitats to further support wildlife include Log piles, slow worm mats, bird nesting boxes, bat boxes and a bug hotel. At the bottom end of the scale there are a number of lichens on the monuments and these are expected to flourish in the southern section of the site now that more light is getting in.